First, make sure you have Ruby installed. On Windows, you can install Ruby with RubyInstaller. A mobile phone number must be associated with your account in order to obtain write privileges. If your carrier is not supported by Twitter and you are unable to add a number, contact Twitter using https://support.twitter.com/forms/platform, selecting the last checkbox. Some users have reported success adding their number using the mobile site, https://mobile.twitter.com/settings, which seems to bypass the carrier check at the moment. This command will direct you to a URL where you can sign-in to Twitter, authorize the application, and then enter the returned PIN back into the terminal. If you type the PIN correctly, you should now be authorized to use t as that user. To authorize multiple accounts, simply repeat the last step, signing into Twitter as a different user. Account information is stored in a YAML-formatted file located at ~/.trc. Note: Anyone with access to this file can impersonate you on Twitter, so it's important to keep it secure, just as you would treat your SSH private key. For this reason, the file is hidden and has the permission bits set to 0600. Typing t help will list all the available commands. You can type t help TASK to get help for a specific command. t update "I'm tweeting from the command line. Isn't that special?" t does_follow @ev && t dm @ev "What's up, bro?" t search timeline @sferik "query"
Deep search: Instead of using the Twitter Search API, which only goes back 6-9 days, t search fetches up to 3,200 tweets via the REST API and then checks each one against a regular expression. Multi-threaded: Whenever possible, Twitter API requests are made in parallel, resulting in faster performance for bulk operations. Designed for Unix: Output is designed to be piped to other Unix utilities, like grep, comm, cut, awk, bc, wc, and xargs for advanced text processing. Generate spreadsheets: Convert the output of any command to CSV format simply by adding the --csv flag. 95% C0 Code Coverage: Well tested, with a 2.5:1 test-to-code ratio. @jphpsf wrote a blog post explaining how to use t to backup your Twitter account. t was also mentioned on an episode of the Ruby 5 podcast. t was also discussed on an episode of the Ruby Rogues podcast. If you discuss t in a blog post or podcast, let me know and I'll link it here. If you're running Zsh or Bash, you can source one of the bundled completion files to get shell completion for t commands, subcommands, and flags. Don't run Zsh or Bash? Why not contribute completion support for your favorite shell? 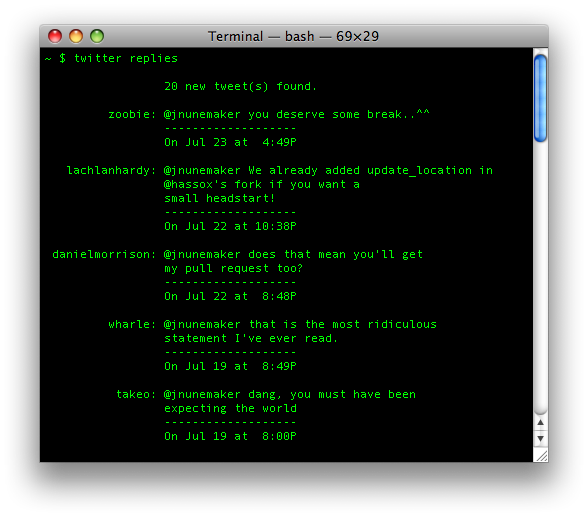 The twitter gem previously contained a command-line interface, up until version 0.5.0, when it was removed. This project is offered as a successor to that effort, however it is a clean room implementation that contains none of the original code. If you are running t on a remote computer you can use the flag --display-uri during authorize process to display the url instead of opening the web browser. Copyright (c) 2011-2014 Erik Michaels-Ober. See LICENSE for details. Application icon by @nvk.